The Netherlands has no formal pre-primary educational provision. From the age of four onwards, children attend primary school. Although the mandatory school age is 5, almost all children (98%) begin school at age four. For children under the age of four there is no formal educational provision, but there are various childcare facilities available outside the education system. Playgroups: these groups are open to all children aged 2 to 4 years, and are the most popular form of pre-primary provision. Children usually attend the playgroups twice a week, about 2-3 hours per visit. The main aim of the playgroups is to allow children to meet and play with other children and to stimulate their development. At the national level, no educational goals have been defined for playgroups. Most playgroups are subsidised by local government, but income-related parental contributions are often also demanded. Pre-schools: an increasing number of playgroups offer development stimulation programmes and have a more educational focus. These so-called 'pre-schools' are particularly intended for children from disadvantaged backgrounds (children of parents with low levels of education), with the central aim of preventing and mitigating educational deficiencies, particularly in the domain of language development. Day nurseries: the day nurseries cater for children aged from 6 weeks to 4 years. They are open on weekdays from around 8.00 to 18.00 hours. The main function of the day nurseries is to take care of children in order to allow parents to work. They provide daily care for children and opportunities to meet and play with other children. The responsibility for childcare facilities as a policy area has recently been transferred from the Ministry of Social Affairs and Employment to the Ministry of Education, Culture and Science. Primary education in the Netherlands comprises general primary education, special primary education and (secondary) special education. The primary education programme consists of eight years for education, from the age of four until the age of twelve. Compulsory education starts at the age of five, but children can attend primary school from the age of four. In the school year, 2007/2008 there are 7909 primary schools for 1,663,500 pupils. These include public-authority and denominational schools. Besides these, there is a small number of private schools not financed by the government. Public authority schools are open to all children, no matter what their denomination or philosophy of life may be. Public authority schools do not work on the basis of a denomination or philosophy of life. These schools are mostly run by the local authorities, a school board, a foundation or by a legal person appointed by the city council. About one third of all children go to public authority schools. Denominational schools are run as an association, of which parents can become members, or as a foundation. There are all sorts of denominational schools. Most of these schools are Roman Catholic or Protestant. In addition, there are Jewish, Islamic, Hindu and humanistic schools, and so called 'free schools' that base their education on the philosophy of Rudolf Steiner. And, there are schools that organise their education according to certain pedagogical principles, such as Montessori, Jenaplan, Dalton and Freinet schools (these can be either public-authority or denominational schools). There is also non-denominational private education, which does not depart from a special philosophy of life. About two thirds of all children go to denominational schools. For pupils who require specialized care and support, there is special (primary) education and secondary special education. In 1998, schools for children with learning and behavioural difficulties (lom) and children with moderate learning difficulties (mlk) were converted to schools for special primary education (SBAO). These schools fall under the legislation of primary education. Vmbo students can receive additional support through learning support programmes (lwoo). After vmbo, at an average age of 18, students may transfer to vocational education (mbo). Those who have completed the theoretical programme can also choose to transfer to havo. havo is intended as preparation for higher professional education (hbo). vwo is intended to prepare students for research-oriented education (wo). In practice, however, vwo graduates also transfer to hbo. 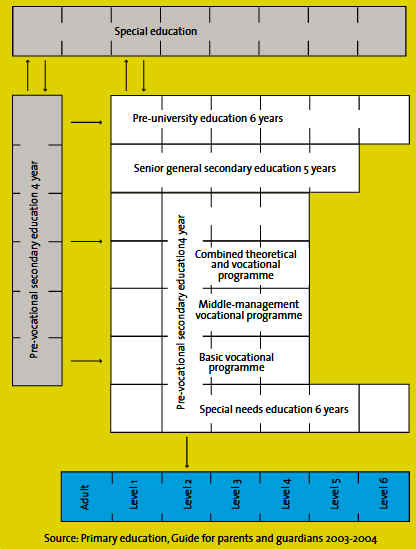 The school types differ in terms of the duration of their programmes: vmbo takes 4 years, havo 5 years and vwo 6 years. Secondary schools have completed the implementation of two major educational innovations: the innovation of upper secondary education and the introduction of vmbo. In the 1999/2000 school year, a new structure for the second stage of havo and vwo education was introduced. All havo and vwo schools introduced set subject combinations and the concept of independent study in the last two/three course year (years four and five for havo, and years four, five, six for vwo). In 1998 vbo and mavo were combined into vmbo. At the same time, the learning support departments (lwoo) were given a more definite shape. In 1998 ivbo was incorporated into the learning support departments. In addition, practical training programmes (pro) were initiated. With the conversion of practical training programmes and the learning support departments, special secondary education has been incorporated into mainstream secondary education. On 28 May 1998, an Act was implemented which required all svo/lom (for children with learning and behavioural difficulties) and svo/mlk (for children with moderate learning difficulties) schools either to merge with a mainstream secondary school, or to convert to a practical training institution (pro) or a special education centre (opdc). middle management and specialized training (level 4). The programmes last a maximum of 4 years. Higher education comprises higher professional education (hbo) and university education. These types of education are provided by hbo institutions and universities respectively. As of 2008, there are 41 hbo institutions and 13 universities. There is also one establishment providing open higher distance education, the Open University of the Netherlands. In addition there are number of approved private institutions and institutes for international education. The private institutions include several theological colleges, the University for Humanist Studies and Nijenrode University (business education). The international education colleges include the Institute of Social Science (ISS), International Institute for Geo-Information Science and Earth Observation (ITC), Institute for Urban Housing and Development Studies (IHS), and the Institute for Water Education (IHE). and quality of the courses they provide. Quality control is exercised by the institutions themselves and by external experts. With effect from 1 September 2003, the Education Inspectorate�s external quality assurance dossier has been transferred to the Accreditation Organisation of the Netherlands and Flanders (NVAO). The NVAO took over two tasks of the Education Inspectorate: a) the follow-up to old style reviews previously approved by the Education Inspectorate, the so-called evaluation of administrative processing, and b) the follow-up to reviews conducted from 2003 on. In order to be able to link up with international developments, the Bachelor�s - Master�s degree structure was introduced in the 2002/03 academic year. The Bachelor programs comprise of 180 ECTS , which amounts to three years of full-time study. The Masters programs take 1 year (60 ECTS) to 2 years (120 ECTS). Higher professional education is extremely diverse: courses lead to some 250 different qualifications for a wide range of occupations in various areas of society. There are both broad and specialist courses. There are large hbo institutions offering a wide variety of courses in many different sectors and medium-sized and small colleges offering a small assortment in one sector only. Administrative mergers have reduced the number of hbo institutions from almost 350 in the mid-1980s to 41 in 2007. Programmes are divided into seven sectors: Education, Engineering & Technology, Healthcare, Economics, Behaviour & Society, Language & Culture, and Agriculture & the Natural Environment. The last sector falls under the Ministry of Agriculture, Nature and Food Quality (LNV). cluster 4: education for pupils with behavioural disorders from existing schools, for severely maladjusted children, chronically sick children (psychosomatic) and pupils in paedological institutes. Within secondary special schools, pupils can follow the curriculum for practical training, vmbo, havo or vwo. In 2003 the financing mechanism (funding special schools on the basis of the number of children that are placed) has been changed in favour of linking financing of special services to the student involved, regardless of the type of schooling. If a student meets the criteria for this so-called 'pupil-bound budget', parents and pupils can choose a school, special or mainstream, and take part in decision making on the best way to use the funds in order to meet the student's special needs. Peripatetic supervision entails the provision of extra help to enable pupils with special educational needs to attend a mainstream school. The help is provided by teachers from special schools. In the Netherlands, there is a growing continuum between separated education (special schools) and full inclusive schools. There are many mainstream schools with pupils with special educational needs in regular classes and mainstream schools with a special group for children with special needs within the school. Some mainstream school specialize in a particular target group and some mainstream schools collaborate intensively with special schools.